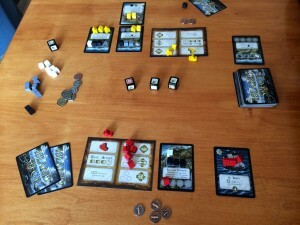 Island Siege caught my interest when it was a Kickstarter project but I only picked it up recently. A game for 2-players, it’s a card game at heart but feels bigger because the cards played stay on the table (well, until they’re blown to smithereens) and there are some very nice metal coins, a few wooden meeple and some dice too. Fortresses can be built for free, but adding extra building blocks (black/grey/white cubes) from your supply makes them stronger and earns coins. Buildings and ships can be built by moving enough colonists from a single fortress card to the building/ship card and this also earn coins. Buildings are added to a fortress giving it special abilities, but buildings are lost if the fortress they’re attached to is destroyed. Ships are independent, have special abilities and can also be destroyed.